A Southside Tradition for Over 50 Years! Family owned and operated, Rudy's Seafood has been serving great food at a great price since 1964. The Daily Special includes 2 fillets of Alaskan Pollock hand breaded daily and served golden brown, 3 jumbo butterflied shrimp, a generous portion of french fries, creamy coleslaw, and our delicious homemade tarter sauce. Don't forget the lemon & chile serrano. Come try our outstanding Fish Tacos on your next lunch break. We use a Garlic and Herb seasoned Tilapia grilled in extra virgin olive oil to a perfect crisp, and serve them on hot corn tortillas topped with Fresh Avocado, Pico de Gallo, and a Chipotle Ranch. Add an order of sweet potato fries. 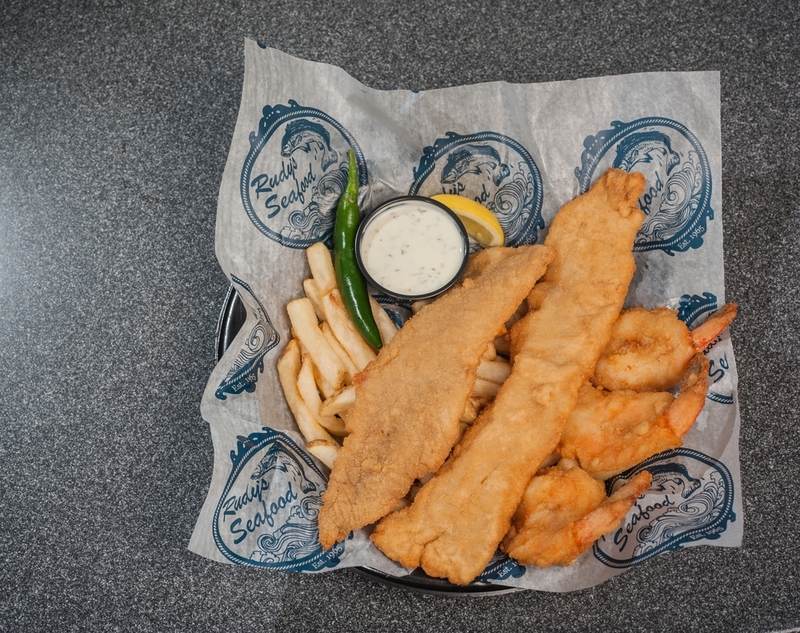 Heaping platters of fish and shrimp are the norm at Rudy's. Come see why our family platters are the best in town. Have a large family to feed. Try this 15 piece fish platter.